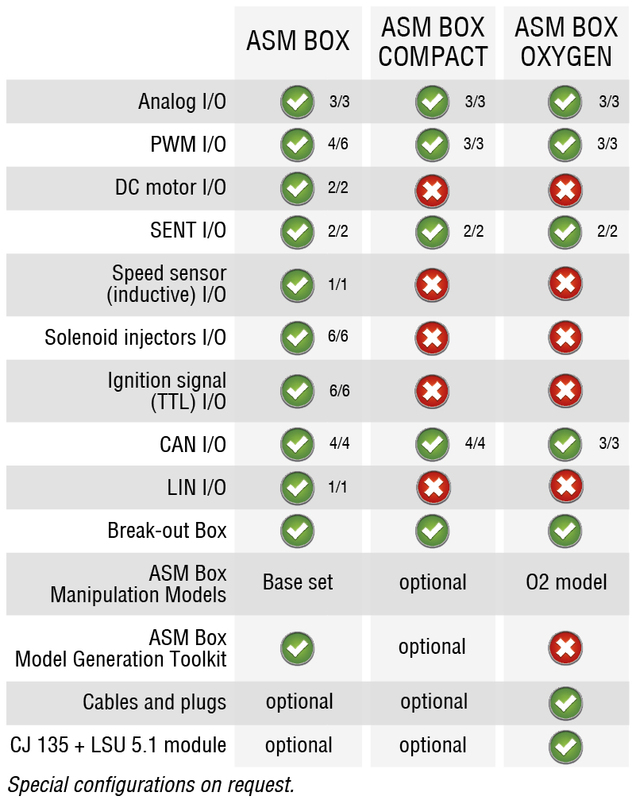 The ASM Box allows efficient verification of PVE and OBD calibration via electrical modulation of actuator and sensor signals, especially for U.S. homologation with government mode in addition to the common user mode. Because no faulty hardware is required for failure generation it achieves a cost savings of at least 20 percent in typical use cases. Using the ASM Box for automated drifting of sensor signals for robustness testing improves the quality as well as the efficiency. 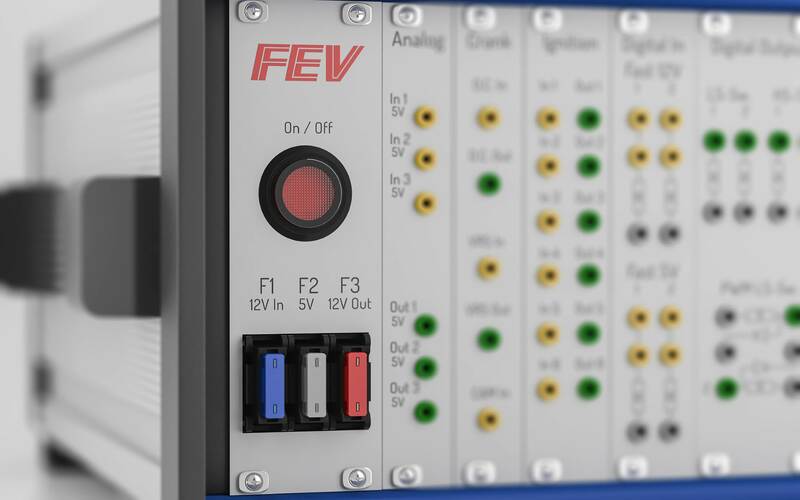 Easy modulation of almost every signal – from injection parameters to NOx or particle sensors: The ASM Box is a milestone in vehicle homologation and PVE. CAN protocol for NOx sensors and PM sensors as well as modulation of any message on a powertrain CAN bus without interfering with other messages. For SENT protocol the feedback message of the Delta P sensor, EGR-LF and MAF sensor signals have been modulated. 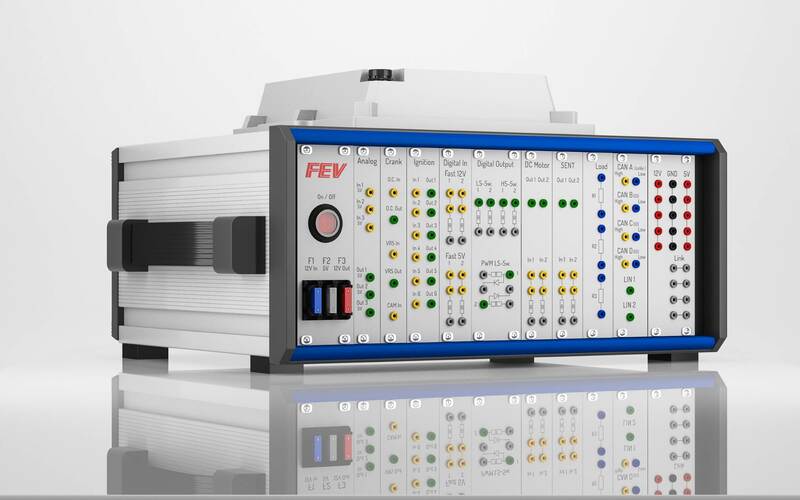 Successful modulation via PWM signals of EGR-HF, AIR flap, MAF sensors, ignition and VVT actuators. 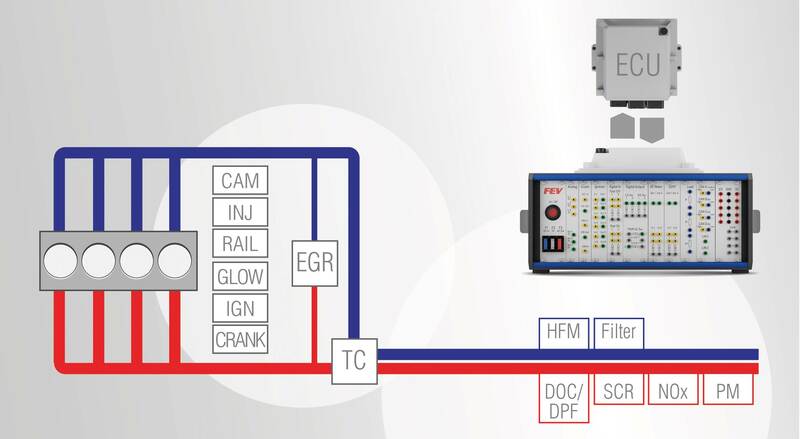 Any temperature sensor and rail pressure sensor via analog signals. Oxygen sensor simulation for CJ135 has been realized for LSF, LSU4.9, LSU5.1 and LSU-ADV. One of the highlights are injection system failure patterns for both Solenoid and Piezo injectors. The common misfire patterns are realized as well as complex scenarios such as shifting the start and end of injection. Back side of the ASM Box, a ruggedly designed breakout box. 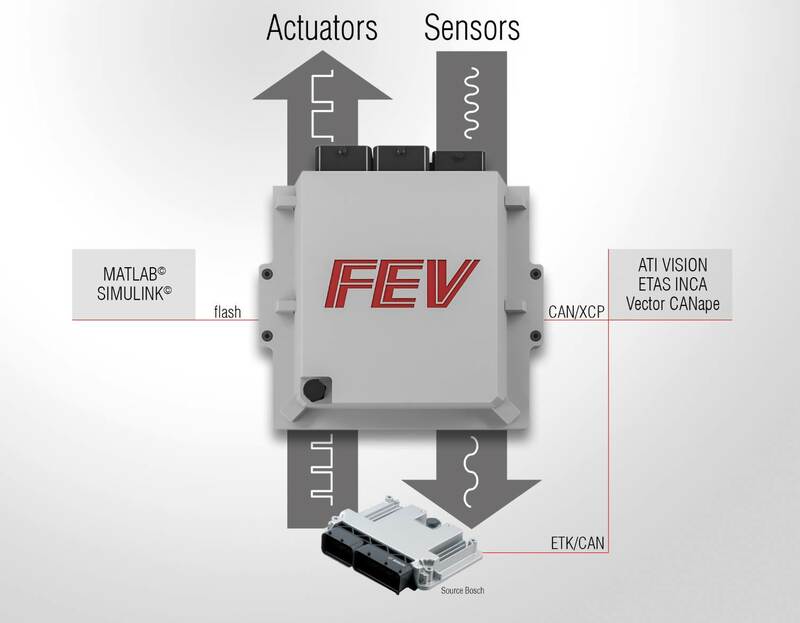 The ASM Box allows comprehensive electrical modulation of actuator and sensor signals. Control system modulation e.g. SENT, LIN and CAN. Ease of operability through government mode. 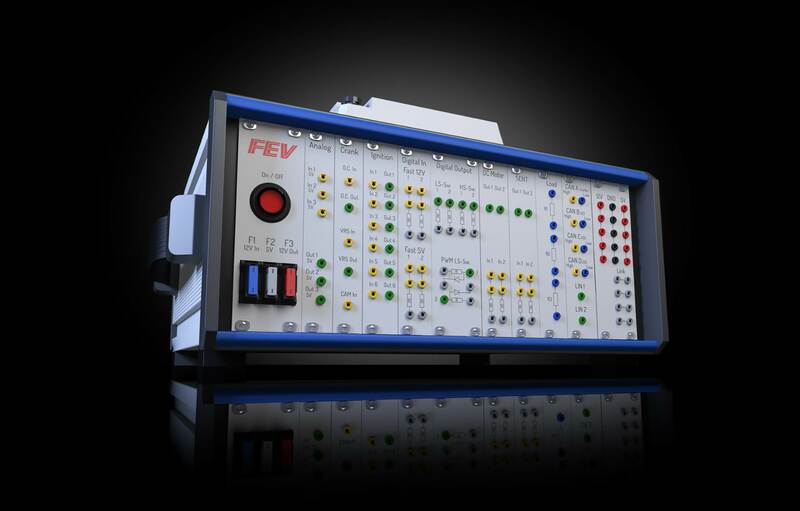 FEV’s ASM Box is based on a model-based automotive RCP system. 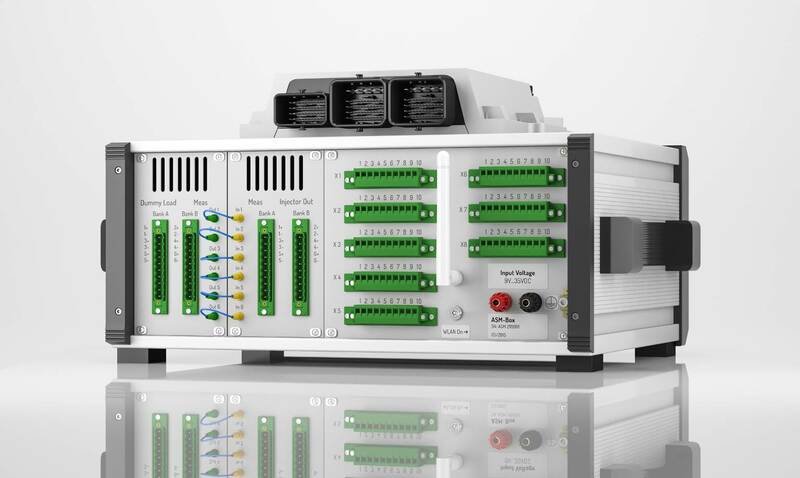 With predefined Simulink® models, efficient and fast modulation of any engine component can be realized. The standard models can be easily customized to satisfy individual modulation needs. 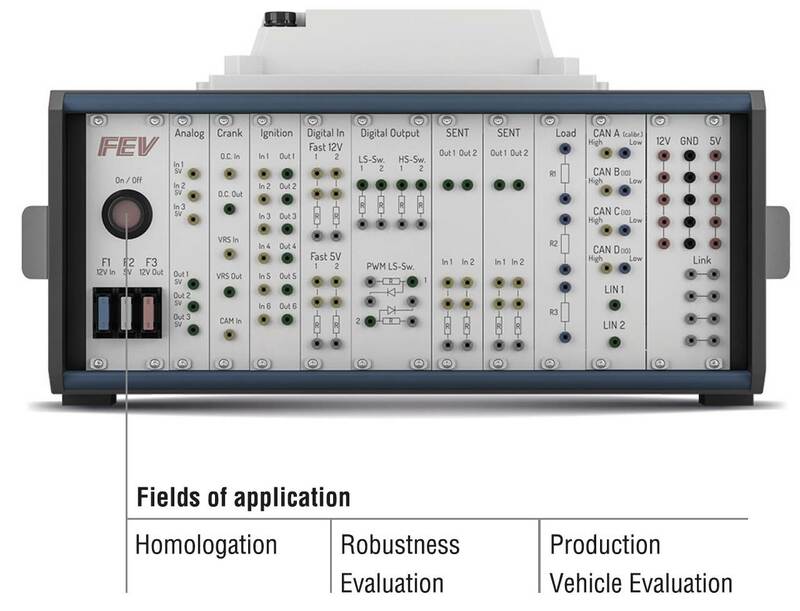 In the case of calibration tasks, it is possible to use a calibration tool with XCP support to control the model behavior and simultaneously handle ECU labels and signals. In the case of homologation, the ASM Box offers a user friendly GUI with the possibility of controlling the system via WiFi and LAN. 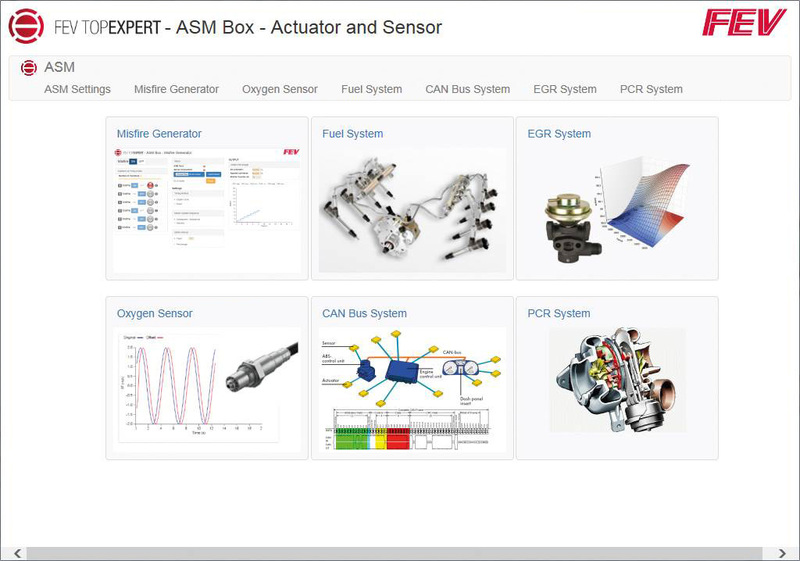 The ASM Box ist part of TOPEXPERT – software solutions for model-based calibration.